I Can Barely Draw Staff Meeting — Minorities. Four people are sitting at a table: A man holding a letter, a curly-haired woman, a second man, and a straight-haired woman. Man holding letter: The government's affirmative action office has warned us that minorities are under-represented in our comics. The next panel shows only the curly-haired woman and the second man. Curly-haired woman: That's absurd. Our comics use abstract stick figures. The next panel shows only the man holding the letter. Man holding letter: They say our comics lack any genuinely funny characters. Off-panel voice: We're in trouble. 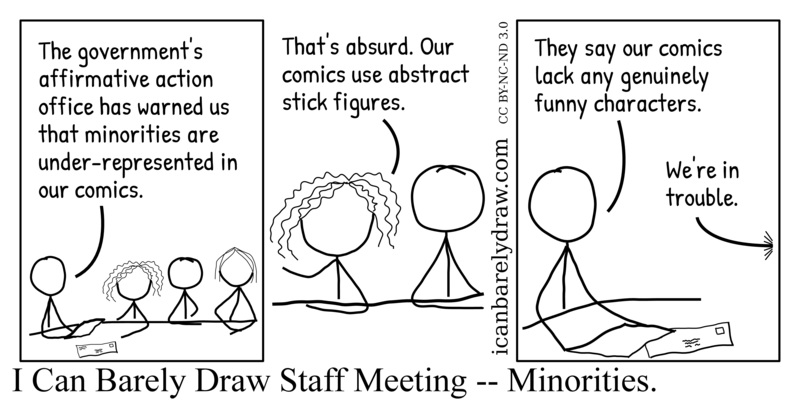 Title: I Can Barely Draw Staff Meeting -- Minorities.